The author had two hemoglobin A1C checkups: 6.1% on 9/1/2017 and 6.9% on 2/1/2018. He selected two equal length periods of 453 days with 1,369 meals each: Period A (4/1/2017 – 8/31/2017) and Period B (9/1/2017 – 1/31/2018). 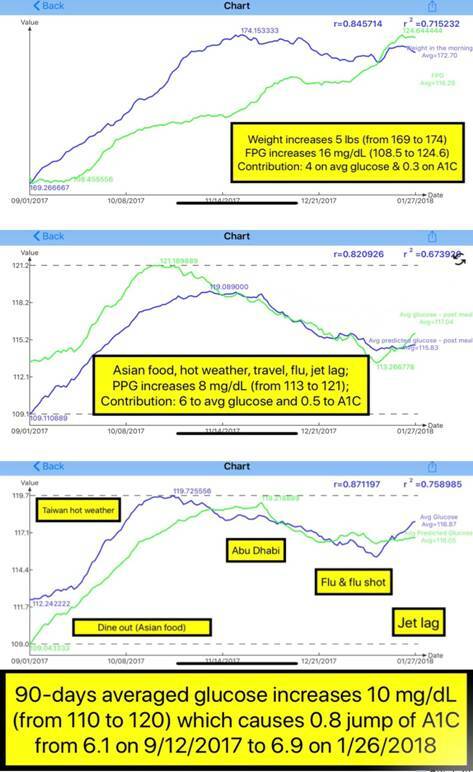 He utilized math-physics approach to analyze his A1C and lifestyle. In Period B, weight increased 7 lbs. and fasting plasma glucose (FPG) increased 16 mg/dL which caused 4 mg/dL increase on daily glucose and 0.32% increase on A1C. For the A1C, 0.28% was due to weight gain and 0.04% was due to other secondary factors, e.g. stress, jet lag, and illness. His postprandial glucose (PPG) increased 8 mg/dL which caused 6 mg/dL increase on daily glucose and 0.48% increase on A1C. Two major factors were carbs/sugar intake (additional 3 grams) and exercise reduction (less 300 steps) due to hot and rainy weather. Food and exercise contributed 76% to his PPG change and caused 0.36% of A1C increase. The other secondary factors, including weather, illness, travel, jet lag, caused 0.12% of A1C increase. In summary, 0.32% from FPG (from weight increase) and 0.48% from PPG (from dinning out more) made his A1C rise to 0.8%. 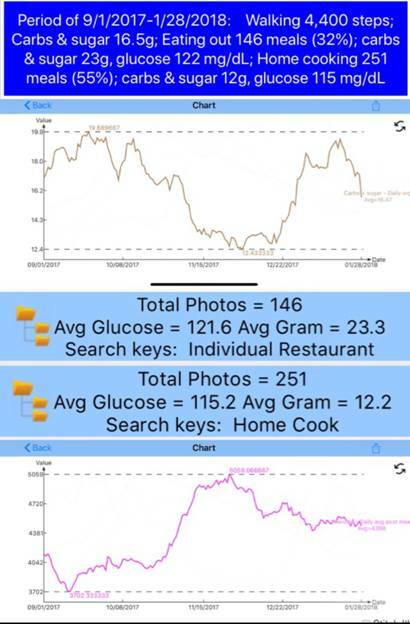 Carbs & sugar: 24 grams. Carbs & sugar: 23 grams.